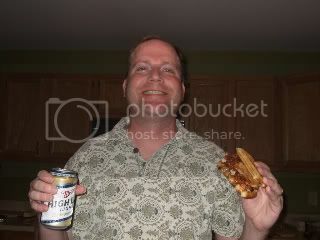 LTHForum.com - Fried Chicken and Waffles - Wow..
Fried Chicken and Waffles - Wow..
LTH Home > Chat > Shopping & Cooking > Fried Chicken and Waffles - Wow..
Never tried fried chicken and waffles before, had heard of it, and seen it, but never thought the combo would work. Was I wrong, probably the best thing I have made, or eaten all year. 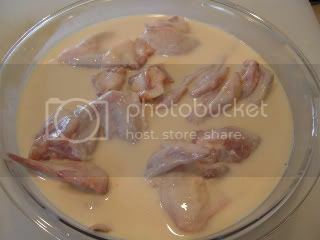 Soaked the chicken wings in shark sririacha, buttermilk, and eggs for aboout 6 hours. 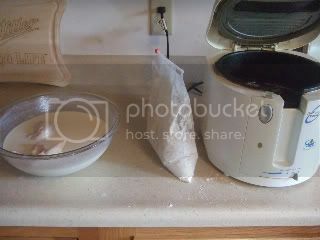 Then tossed them in a plastic bag 2 at a time with a mix of flour, balck pepper, season salt, and garlic powder. 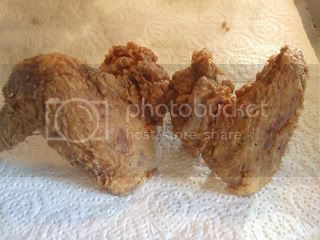 Then deep fried 2 at a time. 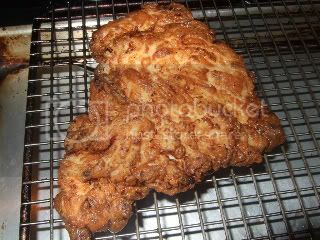 result was a beatiful crisp crust, and tender juicy chicken. THe waffles were a basic recipe, flour, salt, sugar, vanilla extract, baking powder, milk, egg, and melted butter(1 and 1/2 stick). Mixed the wet and dry seperate, and quickly combined. Served the fried chicken wings over the buttered waffle, doused with syrup, and Texas Pete and I was good to go. Brilliant, sweet, hot, salt, different textures. what a dish. thanks for lookin at my pics of my Sunday Supper - Marseilles style. I'm fighting the urge to go on Amazon and buy myself a fry-daddy as I type this. 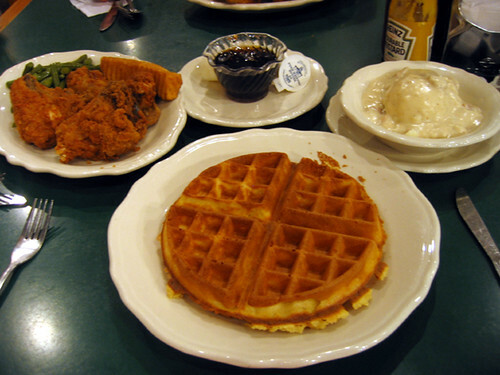 From my reading about chicken and waffles in 19th- and early-20th-century novels, the dish was historically served with cream gravy. And, of course, the chicken would have been fried in a cast-iron skillet. When I first heard of chicken and waffles I assumed that it must have gravy all over it, sort of like chicken and dumplings (except with fried chicken), or a hot roast beef sandwich, or something. When I learned that it merely consisted of chicken (over here) and waffles (over there) it seemed rather diminished as a dish. Or at best it was like pizza and beer-- two things that make a nice combo, but share no common ingredients or gain much from being in your mouth at the same time. I'm glad to learn that once chicken and waffles had the Aristotelian unity that seemed natural to me when I first heard of them. Mike G wrote: Or at best it was like pizza and beer-- two things that make a nice combo, but share no common ingredients or gain much from being in your mouth at the same time. Beer and cheese can lead to superb pairings, but the restrained flavor of cheese on most pizza, as well as the tomato sauce, seem better suited to wine. For maximimally poor pairing with pizza, try whole milk, which was my practice during post-college years. I once visibily nauseated a table mate who watched in horror as I washed down huge slabs of 'za with cow juice. I admit: it should have revolted me, and yet it did not. Looks terrific, how about I'll be over in an hour. Served with gravy at Roscoe's in Los Angeles, delicious with or without. My preference, spin the wheel, syrup, butter, hot sauce and gravy. I like the butter, syrup, gravy, hotsauce combo. Thats how I will roll next time. And there will be a next time, this combo is going to be on my regular rotation. 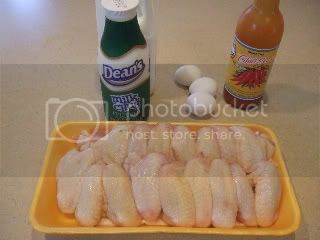 the only other thing different I will do next time is fry up a whole chicken not just wings. Right, but it's not gravy on the waffles. I envisioned some close waffelian relation to biscuits and gravy, but it was chicken with a side of waffles, as you might serve chicken with a bowl of Cheerios or a bag of marshmallows. Id probably try a bite of the chicken, and waffle with a little gravy drizzled over it to see how it worked with all the savory, and sweet going on. 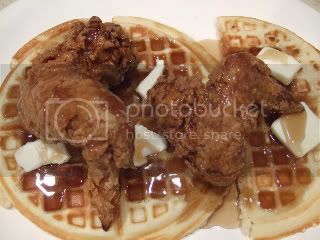 I didnt think the fried chicken and waffles would work, but it surprised me, it was of a sum of its parts type of dish. kind of like a reuben, all the componants are good individually, but brilliant when brought together imho. When I first learned about Chicken and Waffles some years ago, I assumed it was fried chicken, waffles and gravy. Over time this picture was adjusted to chicken, waffles and syrup. 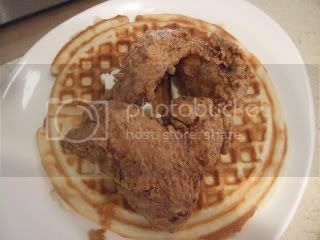 Culturally I have always associated chicken and waffles with the black foodways. Earlier this year at a presentation at the Longone Symposium in Ann Arbor, it was claimed the Amish originated chicken and waffles. Frustratingly they did not allow questions, which means there was no opportunity to inquire if his research included how this dish reached the black community. It is entirely possible these may be two parallel events with one not influencing the other. I don't know. For a long time it was my plan to order chicken and waffles whenever the first opportunity allowed. I somehow got my brain stuck I needed to visit a restaurant where chicken and waffles were a line item on the menu. I finally loosened my grip on this purist idea. Last week at the Full Moon, I shared an order of waffles and half a broasted chicken, which came with choice of potato. I opted for mashed potatoes with sausage gravy usually served with biscuits and gravy. The best of all worlds: fried chicken, waffles, syrup, mashed potatoes and sausage gravy. I certainly liked both the classic combination chicken, waffles and syrup as well as sausage gravy, which has always seemed a fitting addition to me. I liked it all! Now chicken and waffles are just an order away just about anywhere I go. I got the idea to finally try this dish off a episode of DDD, where Guy went to a soul food restaurant and the dish was served as mine was: waffle, butter, fried chicken, syrup, hot sauce. never thought of, or heard of gravy on this combo until today. I imagine like alot of things variations on waffles and fried chicken are regional. either way butter, waffles, fried chicken, hot sauce, gravy, and any other artery clogging, tasty ingredient someone wants to work into a dish works for me. Mike G wrote: Right, but it's not gravy on the waffles. I envisioned some close waffelian relation to biscuits and gravy, but it was chicken with a side of waffles, as you might serve chicken with a bowl of Cheerios or a bag of marshmallows. All this time I've been under the impression that the chicken goes on top of the waffle, syrup gets poured on the whole mess, and the two are eaten simultaneously. Just like in Jim's last pic. At least that's how I've done it, and have loved it that way. Sweet, salty, meaty, crunchy & bready is present in every bite...delicious. I've never added hot sauce though...adding spicy & a bit of sour to the mix would cover the gamut of tastes. Genius! I agree that there has to be something to bring together the chicken or waffles, but no matter the history, I would think there's nothing wrong with a sweet topping (like maple syrup) . . . in fact, I think I would prefer it that way, and leave the gravy-type topping for biscuits and gravy. I'm thinking a perfect mixture might include maple syrup, honey and some spicy chili pepper. 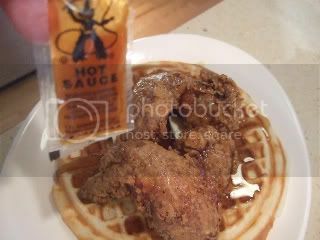 I agree with Gary; Roscoe's does indeed serve great chicken & waffles, I did the Long Beach location last year. Roscoe’s may be one the best restaurants that I’ve ate at in SoCal. The waffles were great, I was stuffed, and yet I still found myself trying to eat one more bite. 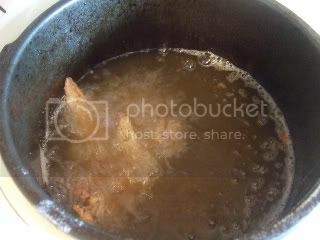 And the fried chicken was off the hook! I messed up ordering and got the gravy on top, now don’t get me wrong, the gravy was good and perhaps as a side to dip my chicken would have been wiser, but that chicken really didn’t need it; it stands on its own. I also had an order of red beans & rice, I couldn't move for hours afterwards. Arguably my best meal in SoCal ever. Which was fine with me, because afterwards, I was stuck in two hours of traffic getting back up to the valley where my sister lives… ahh California. If any of you ever find yourselves out that way, you should definitely make a visit. Orange, over on Clark near Belmont, served up a decent chicken and waffles. 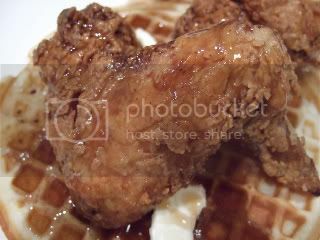 Mike G wrote: When I first heard of chicken and waffles I assumed that it must have gravy all over it, sort of like chicken and dumplings (except with fried chicken), or a hot roast beef sandwich, or something. Well, I can't actually confirm that from my reading. There's definitely cream gravy on the chicken (it appears to be passed at table rather than applied in the kitchen), but whether the waffles are a foundation on the side is unclear. However, at least one novel mentioned dinner rolls being served along with the chicken and waffles, so it does seem that the waffles are intrinsic, rather than a mere breadstuff like the cornbread in beans and cornbread. But I've really been struck by how often the dish turns up until the 1920s. And then it seems to have pretty much vanished from the mainstream. In your information, did you see the Amish connection? Only what I mentioned in the previous thread linked above. wikipedia(I know not the most reliable source, but a source none the less) has a few ideas of the origins of the dish. They cite the Pennsylvania Dutch version as "a plain waffle with stewed chicken on top, and then covered with gravy" not what I think of in regards to chicken and waffles at all. The only versions I have seen, heard about from southern friends(tennessee mountain folk) & made, was a soul food version. The Penn Dutch/Amish version really doesnt sound that appetizing if I want stewed chicken I would prefer some dumplings. 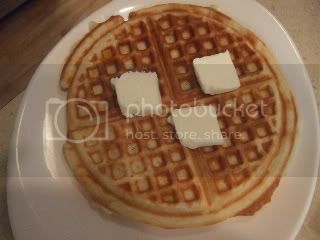 Perhaps gilding the lily, but try adding some corn kernels (frozen ones are fine - just thaw/drain) into the waffle batter. jimswside wrote: They cite the Pennsylvania Dutch version as "a plain waffle with stewed chicken on top, and then covered with gravy" not what I think of in regards to chicken and waffles at all. The only versions I have seen, heard about from southern friends(tennessee mountain folk) & made, was a soul food version. The references in novels are quite clear that the chicken is in whole pieces and not stewed. 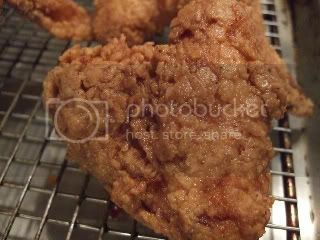 When the cooking method is mentioned, it usually seems to be fried, although I did come across a reference to "the most heavenly waffles and broiled chicken" in a novel set in Tennessee. Id really love to see how these novels say chicken and waffles is done. Perhaps whip up a batch, and post the results. There are links to some of them in the earlier thread, but they're novels, not cookbooks! One of the reasons I infer that chicken and waffles must have been reasonably common is that there's little detail. The authors just assume readers know what they're talking about, much as a writer today might casually refer to a Big Mac. He doesn't have to say, "Two all-beef patties, special sauce, lettuce, cheese, pickles, onions on a sesame-seed bun." 2nd batch of "Marseilles style" (fried wings, waffles, butter, syrup and hotsauce) chicken & waffles for supper tonight. 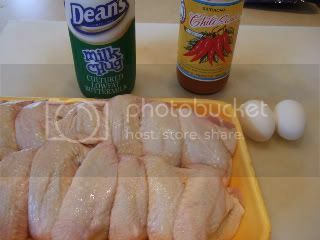 got the wings in the buttermilk marinade that consists of buttermilk, shark sriracha, and 2 eggs. 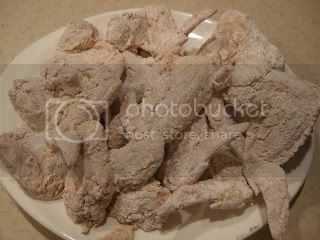 They will get about 6 hoours in that bath before getting tossed in a paper bag that has flour seasoned with Cajun seasoning, black pepper, and atouch of baking powder. waffles will be made from scratch using the time tested Joy of cooking waffle recipe with over a stick of melted butter in the batter..
jimswside wrote: waffles will be made from scratch using the time tested Joy of cooking waffle recipe with over a stick of melted butter in the batter..
Sure hope there is a pic of the completed chicken and waffle. 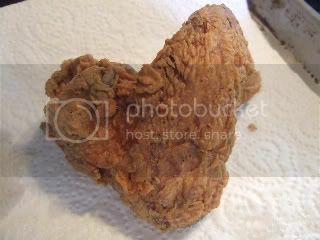 I love fried chicken and waffles!! 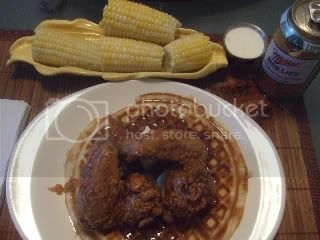 G Wiv wrote: Sure hope there is a pic of the completed chicken and waffle. I love fried chicken and waffles!! there is, I just didnt have time to download yet. "Marseilles Style" fried chicken wings and waffles are on the regular menu rotation now. That looks heart-cloggingly delicious...nicely done! Makes the McMuffin I just scarfed down look even crappier. 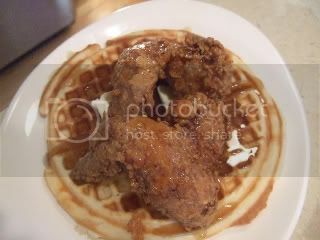 Ill just piggyback on this thread with a take on fried chicken and waffles I have been dreaming about since I saw a version that is offered @ Turner Field in Atlanta(the Hammer its called). Perhaps it was the bottles of cold syrup containg DXM I consumed this week, but it was all I could think of. "The Hammer" is a chicken sandwich using waffles as the "bread" offered @ Turner Field, I think I prefer my take on it(I dont think cheese, or maple mayo would work for my tastes). Their version has cheese, and a maple mayo besides the chicken breast waffle and bacon. Mine has buttermilk onion rings, Texas Pete, buttermilk marinated chicken breasts, syrup, butter & bacon. A fistful of savory, sweet, salty, crunchy goodness. Amish chicken was put in buttermilk, cajun seasoning, garlic powder, onion powder and honey for about 8 hours. Onion got the same treatment sans the honey. Waffle batter was made from scratch with 1.5 sticks of melted butter in the batter. Bacon used is cheap storebought stuff. Wafffles were done in a cheapo waffle maker. Assembly, layed a waffle down, and spread a few pats of butter on it. layed down the chicken and some bacon slices and topped with syrup and Texas Petes,. 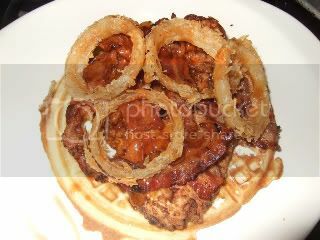 then some onion rings, more syrup and hot sauce, and topped with a buttered waffle. Cut into portions and devoured. Probably took a few years off my life but its all good.